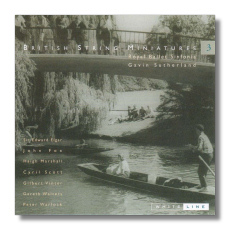 AS&V's White Line series is continuing to unearth a goldmine of British Light Music recordings that is by far (and that includes the Marco Polo series), the most comprehensive survey of this genre in the catalogue. Four volumes of favourites, four discs featuring solo concertos, an Eric Coates series, three discs with overtures and this third disc of aptly titled 'Miniatures' is surely a record! The attractive price also makes these discs very worthwhile to add rarities to one's collection. Vinter's 'Entertainments' is a delightful four movement work that fairly bubbles over with zest and momentum and Sutherland's RBS are surely having a great time all around. Elgar's 'Sospiri' is also beautifully done whilst Warlock's 'Folksong Préludes' reveal this composer's penchant for the grand old tradition. The rest of the works are rarities with John Fox's 'Countryside Suite proving an intriguing find. Marshall's short 'Elegy' is a welcome trip to the past whilst Cyril Scott's First Suite for Strings shows the crafty ingeniousness of this highly rated composer. Finally we have a short symphony by Gareth Walters which is also commendable. The Royal Ballet Sinfonia play with dedication and character throughout so fans of this genre will obviously want this disc in their collection. I wonder what's on in the fourth volume!